I’ve recently received another research inquiry about one of our connected Curbow lines – this time Kerbo/Kerbow, and specifically Dock Kerbo. Again, I’d like to explore this further, because at the end of the day, I do believe that all Curbows (no matter the spelling) are connected by one common ancestor, John Corbo/Corbeau. Based on my look at Dock’s life this is what I found: Doctor “Dock” Singleton Kerbo was born in Jackson County, Georgia in about 1831. The date of his birth is approximate and based on various records, which include the 1850 census; Family Data Collection; U.S. and International Marriage database; and the U.S. Civil War Soldiers database. Dock was the youngest son of Solomon David Kerbow (Kirbow) and Celia “Selah” Witt. If I have the relationships figured out correctly – and this is not proven yet – then Solomon David Kerbow is an uncle of our Tilman Curbow (my husband’s ggg-grandfather), making Dock his younger cousin. In the 1850 census, which was enumerated on 25 November, Dock is indexed as “Doctor S. Kerbow,” age 19, born 1831 in Georgia. He states that he is a laborer. He is living with his older brothers, Jesse M., age 30, a farmer worth $500; and John, 21, laborer. Also in the home is his mother, a widow, Selah, age 68. Additionally, we have a woman named Anna Hatcher, age 45, in the home, whose identity is unknown to me. Dock married Frances Virginia Park probably sometime in 1852 or 1853 in probably Jackson County, Georgia. The year of their marriage is an ESTIMATE on my part based on the year of birth of their first son. I have no information on who her parents were. Virginia was born 3 Oct 1836 in Georgia and died 29 Oct 1903 in Red River County, Texas. In the 1860 census, which was enumerated on the 18th and 19th of July, we find the little family together in Jackson County, Georgia. 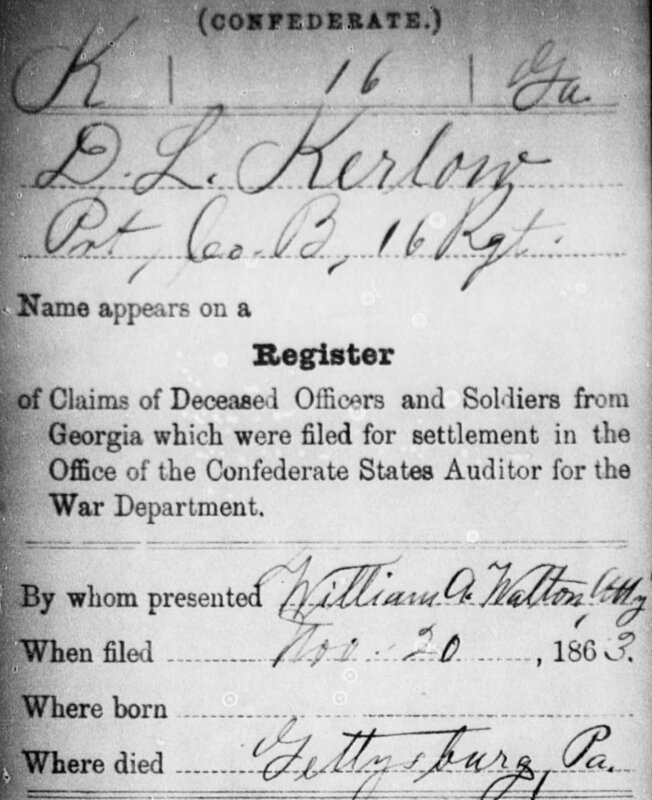 “Doctor S. Kerbo” is 28 years old, born about 1832 in Georgia. The nearest post office is in Mulberry. Doctor is a farmer who owns property worth $700 and personal property worth $874. In the home is his wife, Frances, age 30 and children: John, age 6, Rodemma, age 4 and Josephine, age 2. His older brother John “Kirbo” is living two families down with his family. Based on his service records, we can see that he had a rough time of it, and appears to have spent much of his time in the hospital. His first card is dated Nov. 1861 where he is indexed as “D.S. Kerbo.” It states that he is on furlough for 25 days. His second card is dated Jun 1862 where he is indexed as “D.S. Kirbo.” It states that he left sick at Suffolk on the 18th of April. On 23 Oct 1862 Doctor is again put on furlough for 30 days (Richmond, Virginia). His third card is dated Nov 1862 where he is in the hospital in Richmond, Virginia. (There are two medical reports from September of 1862 which indicate that he was admitted to the General Hospital at Camp Winder in Richmond Virginia on 2 Sept 1862.) Lastly – and tragically – Dock Singleton Kerbo died at the age of 32 years on 2 July 1863 – alone and far from home on a field in Pennsylvania – at the Battle of Gettysburg. The report continues on to detail what pay is owed to Dock’s family. The report is signed by Captain Venable, Dock’s superior officer. Kerbo family members maintain that Dock’s body was transported home to Jackson County, Georgia and that he is laid to rest there. I have not been able to confirm this story. Doctor Single Kerbo and his wife Frances Virginia Park had five children that I am aware of: John Russell (1853-1945); Florentine Roumence (1856-1944); Josephine Laura Etta (1858); Joseph Solomon (1863-1939); and Dock Singleton, Jr. (1863-1958) (obviously named in honor of his father who died one month before his birth). If there are any direct descendants of Doctor Singleton Kerbo that wish to take the ball and run with this, there are so many other things to be discovered about Dock. There are many muster roll cards, hospital reports and service reports pertaining to his Civil War service. These can be obtained on footnote.com. I expect that there may have been a newspaper notice somewhere in Jackson County, Georgia. He owned land – so there are probably deed records in Jackson County, Georgia to be found. He may have even left a Will, which can be found in the probate records of Jackson County, Georgia. If any of you Kerbo/Kerbow researchers are up to the challenge – please share your information here! To end this life story – whether you believe that the cause was right or wrong – Dock Kerbo – I thank you and your family for your sacrifice. Hi Sherra – thanks for visting our site…it is good to hear from you. You are right – these Curbows/Kerbows sure are a hard family to track becuase of the many name variations! Sometimes I think they didn’t want to be found! the grave of Marion Frances first wife Marion Hosch. I believe that they stopped in Clarksville (Red River County), Texas before coming to Delta County and she died in Red River County. Hi Pat – thanks for stopping by and commenting. I haven’t really focused on this family line. They are related to our Curbow family; however, rather distantly. I only know that they came from Georgia and settled in the Delta/Red River County area as you mentioned. I will keep your name and let you know if I ever start digging into that branch of the family tree. marion franeskerbow brother was henry l. kirbow his kids lives in east texas sabine,jasper,kirbyvilletx. they parted ways in la. Patricia – could this be what you are looking for? 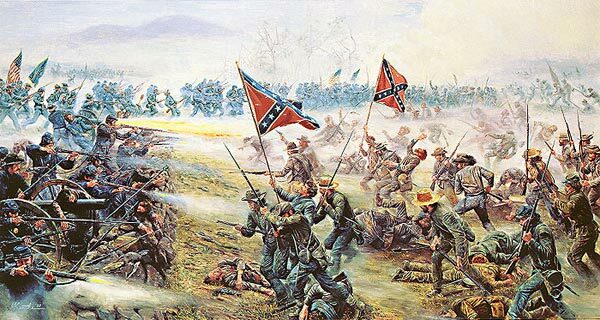 I would like to know if my g-g-g-grand uncle, Doctor Singleton Kerbow, killed in the Wheatfield at Gettysburg, is buried. Was his body returned to Georgia in 1871? Does anyone know? Thanks for the info. I’m attending a wildland Fire course, L580: Leadership is Action, here in Gettysburg this week and this information will definitely add to my experience. Awesome Reese – I have never been to Pennsylvania – but it’s on my list of places to go!